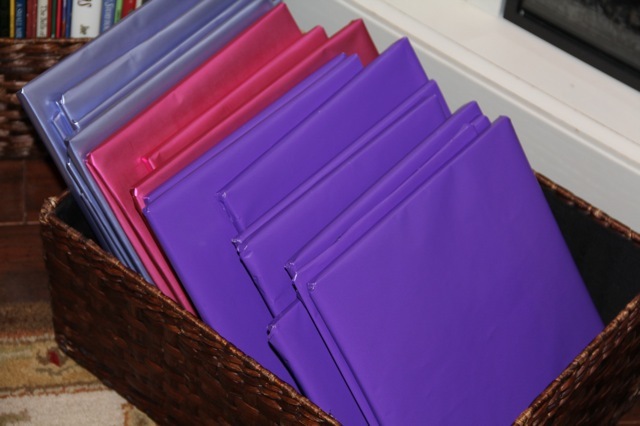 Our picture books are all wrapped, despite running out of the dark purple paper and having to finish up with light purple rather than making another trip to the store! 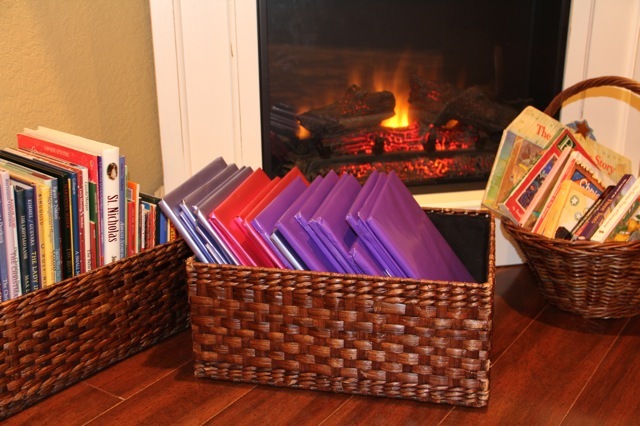 There is one wrapped for each day of Advent, with the remaining books placed in additional baskets. I also filled a couple baskets with all of our remaining Christmas Books, and I don't think I will be needing to check any more out from the library this year... We have plenty to keep us busy all of Advent and Christmas! Just like I have done in the past (here are our lists from 2008 and 2010, or you can scroll through all our Christmas Picture Books here), I thought I would share our list of books for this year. I will be back soon with the new books I choose for the feast of St. Nicholas, and pictures from another new favorite we will be surprising the kids with in a couple weeks. Note: Quite a few of the books on our reading lists have study guides in either Christmas Mosaic, An Illustrated Book Study for Advent and Christmas or Catholic Mosaic: Living the Liturgical Year with Literature an Illustrated Book Study for Cathoilc Children, which we will be using as well! Thank you for sharing your list with us! 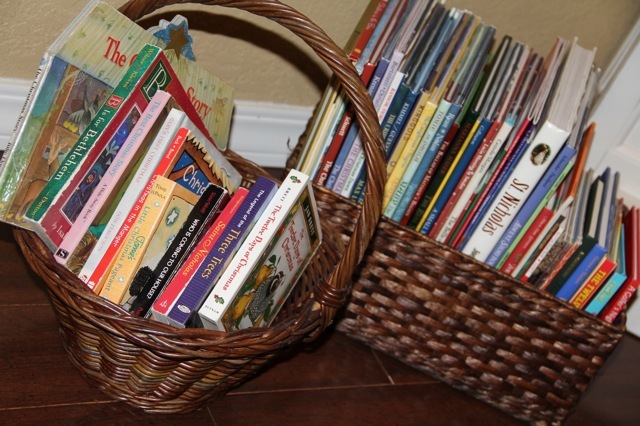 We are just starting out on our journey with the kids and I find it very inspiring how much you incorporate books into your traditions. With a 2 year old, a 1 year old, and another due in May, I am hoping to start building these traditions in our home as well. Do you wrap the same books from your collection every year? If so, how do the older kids react if it's not a "new" book? Are they just surprised at the order with which they are revealed and excited to read an old favorite? It would be costly to buy 28+ new books every year. Yes! It would be very costly to buy all new books each year! I am finding it hard enough to continue our tradition of one new book each, since we started this when we just had a couple children, and now we have 7! Some years I have had to be very creative, due to a tight Christmas budget, but if you watch the sales you can find great deals on Christmas themed books throughout the year. My children know that the books that they unwrap aren't going to be "new" - but they are always so excited to unwrap it and see it again for the first time since last Christmas. They don't know which of the books they will be unwrapping, since I tend to vary the list each year, but they do have a good idea that on the feast of St. Nicholas it will be a book about him, and on the feast of St. Lucy it will be a St. Lucy or Lucia Day book, etc. 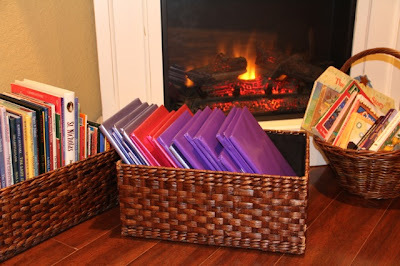 An idea for the future: Usually the library lets you check out books for at least 3 weeks, so you could always check out books from the library to wrap, placing them in the first few weeks, and use your own books closer to Christmas. For many years we were checking out lots of books every Advent. Only these past year or so have I not needed to do that, since our collection has grown so much. I hope that helps... Have a very blessed first week of Advent! What a wonderful suggestion to use the library! Thank you for all your ideas and help! I am the same way about finding new books--my Christmas book wishlist keeps growing! I will have to check out many of the titles you listed.